As the capabilities of mass spectrometers (MS) progress with improved resolution and mass accuracy, the demand for analysis of samples that are more complex have emerged. Some of the sample complexity can be reduced with the use of chromatography; however, co-elution of components is nearly unavoidable. While the use of MS instruments with greater capabilities can be used to more accurately determine elemental composition of components, this still lacks structural information. Here we describe an extension of a new chromatographic deconvolution algorithm based on ion threads to show components throughout the sample analysis while automatically searching databases to aid in structure identification. The feature-finding algorithm (IX 2.0) was used to generate component ion threads and mass spectra that could automatically be searched against a database. Known samples were analyzed for the accuracy at which the software was able to identify structures, including samples from both liquid chromatography (LC) and gas chromatography (GC) analysis. LC-MS samples were searched against a database containing ESI MS2 spectra, while GC-MS samples were searched against a database containing EI MS spectra. Databases searched included a composite of commercially available databases in a *.nd9 format and internal user-created databases (*.cfd) to improve identification of commonly found components within a user’s common chemical space. The component detection and automated searching algorithm was tested for its accuracy in identifying components found in a variety of samples and databases. The newly developed feature uses the extraction of ion threads for identification of components of a sample. The processing routine involved extraction of ion threads, peak integration, grouping of spectral features to generate a component mass spectrum, search component spectra and updating the project with the component and search results. In the case of GC-MS data, the software automatically searched a database(s) for matching EI MS spectra. Due to the lack of reproducibility of MS spectra in LC-MS analysis, the MS2 spectra of found component spectra were automatically searched in user-curated database(s). The new database search feature populated the table of components with the addition of the structure column populated with the top database hit. The software annotated spectra and populated the table with possible fragment, and adduct ions. The data was further interrogated by allowing an expert user to manually review the hit results, allowing the end user to select from any of the returned hits. The presented new feature provided an important advantage in identifying structures—presenting an extensive, unbiased and relevant list of structures to researchers. 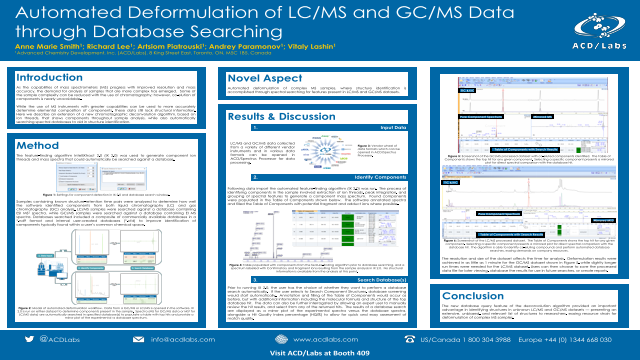 Automated deformulation of complex samples through spectral searching for structure identification of features found in LC-MS and GC-MS datasets.